Sunday June 10th 1894 It was intensely hot. I did not go to church in the morning but went in alone in the afternoon to hear Emeory Miller deliver the sermon in the opera house I went over the river and John & Hatt came with me. Monday June 11th 1894 I partly done my work and went in town this morning. Ida Anderson went over the river with me I got home before eleven oclock and got a good dinner Will cut some hay in the afternoon and helped me make a chicken coop. I am nearly sick with the heat. Tuesday June 12th 1894 I was hard at work all forenoon did a lot of baking and fixed the fence so the pigs could not get in. Will was gone over the river for his hay rack. I wrote a couple of letters in the afternoon and went down in the field where the boys were baling hay. Fanny Graham & Alice Lindle was here awhile. I feel wretchedly short of breath since it is so hot. 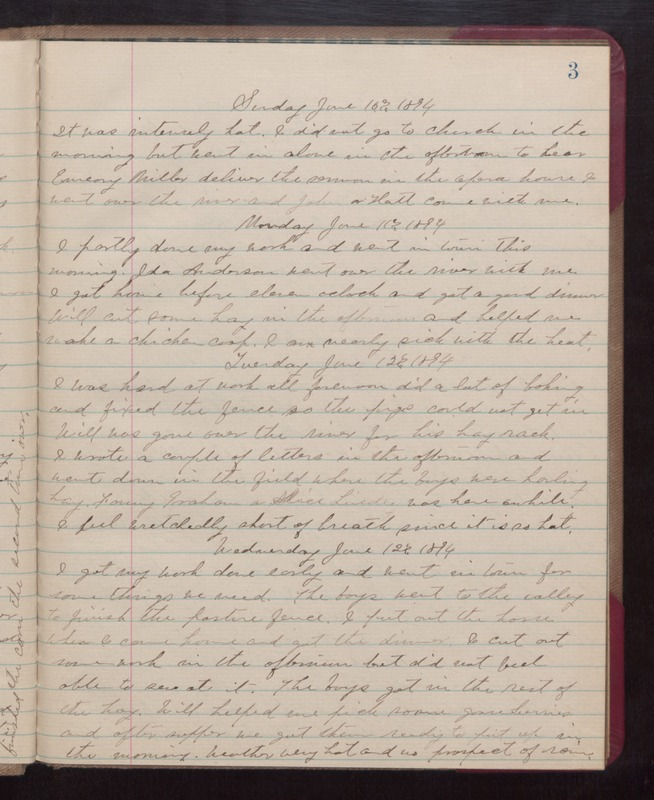 Wednesday June 12th 1894 I got my work done early and went in town for some things we need. The boys went to the valley to finish the pasture fence. I put out the horse when I came home and got the dinner. I cut out some work in the afternoon but did not feel able to sew at it. The boys got in the rest of the hay. Will helped me pick some gooseberries and after supper we got them ready to put up in the morning. Weather very hot and no prospect of rain.